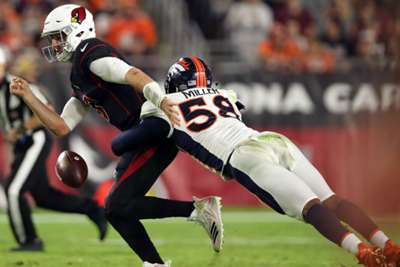 The Denver Broncos thrashed the Arizona Cardinals 45-10 to end a four-game losing streak in the NFL on Thursday. Before the matchup that brought the Broncos south of the Grand Canyon, Von Miller promised a win. He used more colourful language, but in short said Denver would travel back to the Mile High City with a win. He was certainly right about that, as the Broncos thumped the Cardinals at State Farm Stadium. There was a lot at stake when these two teams met in the desert, and it was more than inching towards a winning record. There was plenty of talk regarding both teams' coaching staffs. Denver's Vance Joseph, who was on the verge of losing his job last year, has been anything but impressive at the start of his second season. Arizona's Steven Wilks is manning a one-win team that have yet to turn their season around, and he has not shied away from saying the entire staff's jobs were in question. Joseph will breathe a little bit easier this week while Wilks will be looking for something, anything to help the Cardinals, who are led by rookie quarterback Josh Rosen. It was a matchup of the worsts. The NFL's two worst run defenses faced each other in Arizona, and if you did not know any better you could have thought the defensive pairing was a mismatch. One defense, Denver's, showed up. The Broncos had two pick-sixes in the first quarter alone. Meanwhile, Arizona's unit looked as if it did not even take the field. While the Broncos defense put up points to bolster their lead, the offense took the field and ran the score up against the struggling Cardinals. While quarterback Case Keenum continued to tear apart the defense, all eyes were on the run game. Denver utilised their backs and ran around, through and over Arizona. The Broncos, however, were able to stop the run and held the Cardinals to just 69 yards. Arizona needed to use fourth-year running back David Johnson, but the duo of Todd Davis and Justin Simmons combined to top the Broncos' defensive list with 17 total tackles as they limited Johnson to just 39 yards rushing. After losing four consecutive games, the next contest was a must win for Denver. But, a blowout over a 1-6 team is not the toughest test. The Broncos will at least have one road win when they travel to face the Chiefs and Kansas City's young gunslinger Patrick Mahomes, but if Denver want to start a new winning streak they will have to step it up a few more levels. Defensively, the Broncos did nearly everything well. They applied pressure to the rookie, and tallied six sacks in the process. The Broncos grabbed five takeaways in their efforts, as well, including a late strip stack by Miller. He totalled four tackles, two sacks and the recovery. Offensively, Denver exploited Arizona's struggles. The Broncos finished the game with 309 total yards, 131 of those were on the ground. Their 35 points in the first half were the most by a Denver team since week 10 of 2010. Keenum was 14-of-21 passing for 161 yards and two touchdowns and an interception. It is a performance the Broncos will desperately need to repeat if they want any chance against the Chiefs. Rookies get nervous and in Rosen's primetime debut there was a lot to be nervous about. The rookie was lining up against a Denver defense loaded with Pro Bowl talent, and needed all the help he could get from an offensive unit and their coaches. Rosen found some solace in veteran wide receiver Larry Fitzgerald, who caught Arizona's only touchdown pass, but could not find much comfort elsewhere. This is no surprise, as the Cardinals entered the game with the worst total offense, rushing offense, first-down percentage and third-down conversion rate in the NFL. None of this falls solely on the shoulders of Rosen, who started his first game in week four. The orchestrator, Mike McCoy, has not made the 10th overall draft pick's transition successful. McCoy joined the Arizona organisation after being let go from Denver's team midway through last season. He is facing the same fate with the Cardinals if he cannot make it work in weeks to come.